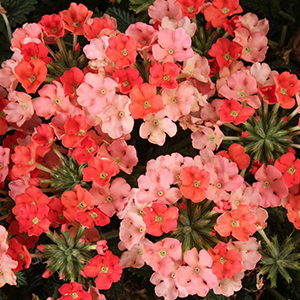 With a mounded, spreading habit and long blooming season, these heat tolerant bloomers can take full sun to part shade in containers or beds, adding sunset colors to your garden. Sporting an upright, columnar stature, dense spikes of salmon punctuate dark green foliage and withstand summer heat and full sun. 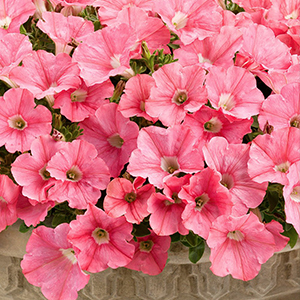 a slightly mounded petunia whose color is reminiscent of warm pink sand doesn’t need deadheading to maintain its flower power through summer’s heat. 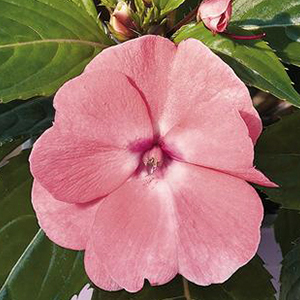 These New Guinea impatiens add a soft pink glow to shady beds and containers with 2-3” mega blooms all season long. 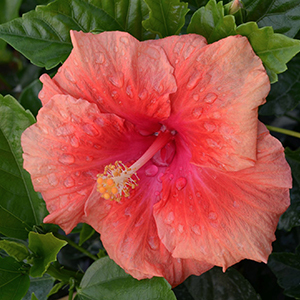 Also sharing the limelight this year are tropical Hollywood™ hibiscus. With names like Drama Queen, First to Flirt, and Gossip Queen, you’ll discover sun loving, long-blooming easy-care plants that will give your beds and containers dramatic flair. You’ll create a celebrity party in full swing- garden paparazzi take notice! 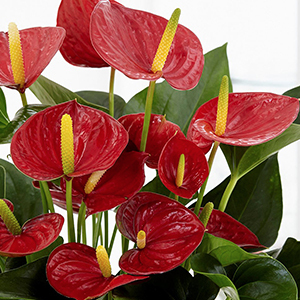 Colorful anthuriums return with their waxy, heart-shaped blooms and lustrous green foliage. 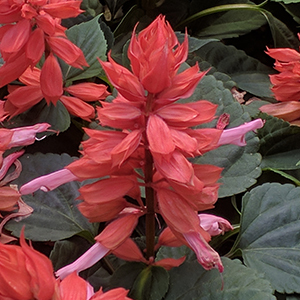 Perfect for adding color to shady containers or garden areas, these tough plants also overwinter extremely well as houseplants. Try something new- wow your garden visitors. 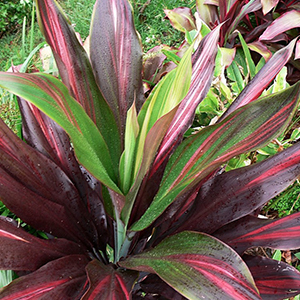 Leafy cordylines, or Ti plants, will add interest to your garden without blooms. Shades of green and burgundy on lance-shaped leaves can be used as taller backdrops to containers or bedding plants in partly shady areas. Calling all tomato lovers- featured this year is a limited selection of organic heirloom tomatoes locally grown by Peace Tree Farms. Come early for the best selection of eight great varieties such as ‘Great White’ to ‘Black Krim’. 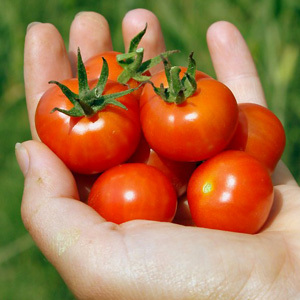 You’ll want to add several to your garden, from the more than twenty tomato varieties on offer. Most varieties will be indeterminate, meaning you will harvest fresh from the garden fruits until frost. This year on the perennial plant tables we hope to feature some interesting pollinator plants that you may not have tried yet in your garden. Come explore the tables, ask questions, and try something new. 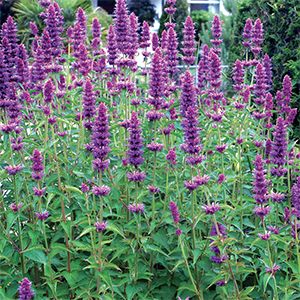 Also known as hyssop or hummingbird mint, these aromatic perennials are known for their long lasting, showy flower spikes, high tolerance for heat, and reliability as a host plant for many types of pollinators. They are frequented by several types of bees and butterflies, and are a favorite of the native ruby-throated hummingbird. Agastache is generally a trouble free plant, grown best in full sun in a well-drained soil. They also perform very well in containers. Look for several cultivars of Agastache, which will reach a height in the two to four foot range, and have flower spikes of purple, blue, orange or pink, depending on the cultivar you select. An alternate common name for penstemon is beardtongue because the flower resembles an open mouth with a protruding fuzzy tongue. It is one of the most diverse groups of flowering perennials native to North America. Penstemons are resilient plants with colorful spikes of tubular flowers which are indispensable to both bumblebees and hummingbirds. Most penstemons will do best in full sun, though species such as Penstemon digitalis (foxglove beardtongue), Penstemon smallii (Small’s beardtongue), and Penstemon calycosus (calico beardtongue), which are native in the eastern US, do well in part sun such as a woodland edge. These penstemons generally reach three to four feet in height, and have a flower color ranging from white to pink to violet. 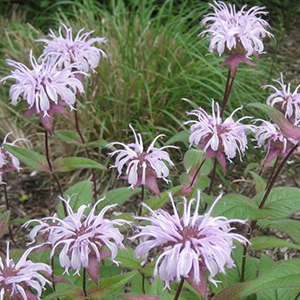 This eastern beebalm is native to the central United States, but is completely hardy to zone 5. It is an upright, bushy plant which will grow one to two feet tall with showy clusters of pale purple, tubular flowers in late spring. This beebalm does well in full to part sun and is very drought tolerant once established. It is very attractive to bees, butterflies, moths and hummingbirds. Eastern beebalm is much less aggressive than other Monarda species and its aromatic foliage is unpalatable to deer. 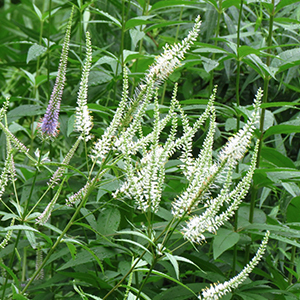 This Veronicastrum, commonly called Culver’s root, is an eastern United States native plant which makes quite a statement in the garden. 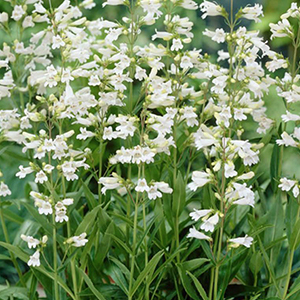 Growing four to six feet tall it is perhaps best suited for the rear of your perennial border. Dense clusters of terminal flower spikes, resembling candelabras, appear in early to mid-summer. Flower color ranges from pure white to a pale lavender and they will attract several types of butterflies, long and short-tongued bees, as well as beneficial wasps. Culver’s root prefers full to partial sun and a wide variety of soil types. 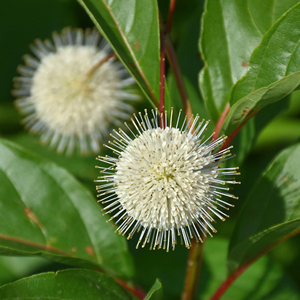 This is a native and easy-care shrub which provides year-round interest in any garden. The emerging leaves are dark red, turn a deep green in the summer, then can be a variety of tones in the fall. Summer also provides small, clustered yellow flowers that last into the fall, turn red or orange as they age, and are appreciated by butterflies and hummingbirds. Diervilla prefer full sun, but will also tolerate partial shade. D. lonicera ‘Copper’ - copper-red new growth, yellow flowers, and attractive fall color D. rivularis ‘Kodiak Black’ - dark burgundy-black foliage, especially intense in spring and fall. D. rivularis ‘Kodiak Orange’ - will light up the landscape with its glowing orange fall foliage D. rivularis ‘Troja Black’ - burgundy- bronze foliage matures to dark green in summer, then bright red in fall D. x splendens ‘Firefly Nightglow’ - leaves are dark reddish-purple, making a striking setting for the sulfur yellow flowers in summer. Leaf color becomes more intensely red in fall. All of the species in this genus provide year-round interest, and the majority of species are native. They produce attractive, white spring flowers in terminal clusters that are followed by edible fruits which are valuable to birds, small animals, and humans alike. The fall color is also of interest, and most species have attractive bark. 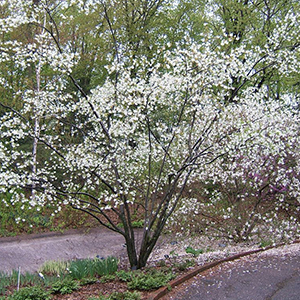 Amelanchier can be grown as a small tree or multi-stemmed shrub. The flowers of A. laevis are held in drooping clusters that can be found in bloom as the leaves unfold in late spring. The leaves begin bronze-purple, turn dark green in summer, then blend to orange or red in the fall. Black fruits follow the flowers, and the gray striped bark and reddish brown stems add another attractive quality. While serviceberries are beloved for their attractive spring flowers, A. x grandiflora ‘Autumn Brilliance’ enhances this reputation with outstanding fall color. The white spring flowers are followed by a tasty purple berry with a flavor similar to blueberries. This specific cultivar performs best in acidic, well-drained soils. 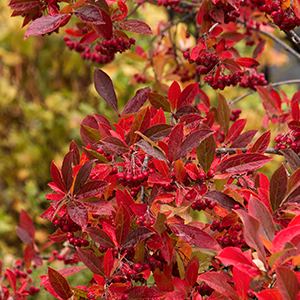 Native to eastern North America, Aronia provides 4 seasons of interest. It begins the season with clusters of white flowers in spring, followed by fall color and berries that persist through the winter. 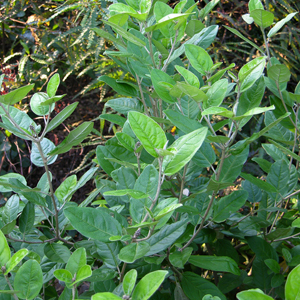 It can grow up to 10’ tall and is well suited as a low-maintenance, naturalizing shrub, or for hedging or mixed borders. Adaptable to many soil types, Aronia is also self-pollinating, deer resistant, and does best in full sun, but also has a tolerance for partial shade. A. arbutifolia ‘Brilliantissima’ - flowers earlier than the straight species and is followed by bright, glossy red fruits that provide nutrients for birds and other wildlife. Its brilliant fall color also sets it apart from other cultivars. A. melanocarpa ‘Viking’ was originally selected for orchard use, but its value in the landscape was quickly realized. The leaves of this cultivar are glossier than the straight species, and the large berries of this cultivar are a dark, purplish black. High in antioxidants, the berries are great for wildlife and also for gardeners to use in jams. Appreciated by butterflies and hummingbirds alike, this deciduous shrub is grown for its ornamental inflorescences. The 4” white blooms with dark burgundy bracts are a real eye-catcher, and bloom summer through fall. 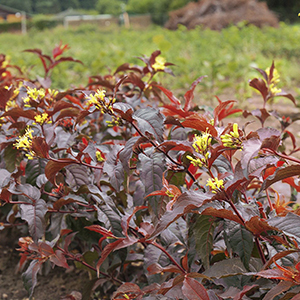 This cultivar’s leaves are a golden yellow as compared to the straight species, and the leaves are highlighted by crimson red as they emerge, complementing the burgundy flowers. Purple-black berries follow the flowers in the fall and provide a treat for the birds as well as the gardener. Golden Lanterns will likely die to the ground annually in Zone 7, but will regrow vigorously each spring. 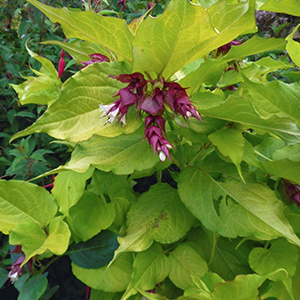 This shrub prefers a sunny location, but will also grow well in partial shade. 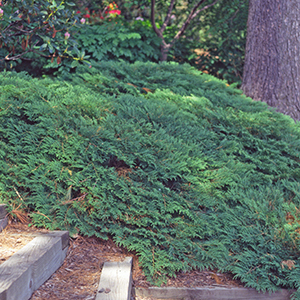 With delicate, lacy foliage that sits in graceful layers, this evergreen groundcover is a good substitute for coarser selections. Its branch tips nod downward, adding a touch of elegance. The foliage is reminiscent of arborvitae and stays green throughout the summer, transitioning to a purple-brown tone in the winter. Native to the mountains of Siberia, this is deer resistant and one of the few conifers that tolerates shade. Choose a roomy location for this groundcover, as it can spread up to 12’ wide or more. This rare, semi-evergreen shrub is only native to a few counties in Alabama. Its leathery leaves are noted for their strikingly silver underside, as well as the bright orange fall color. Leaves will remain on the shrub in mild winter climates and are said to have a banana-apple fragrance when crushed. Greenish-yellow flowers appear in early spring. This shrub prefers full sun to partial shade and is adaptable to a wide range of soils, in addition to being deer resistant. 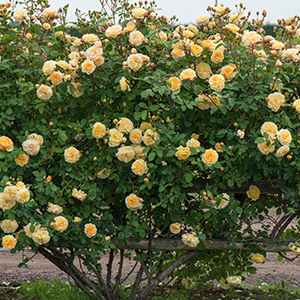 This is a classic, award-winning rose with large, old-fashioned, buttery-yellow blooms absolutely covering a rounded shrub form. The bloom is perpetual, the entire shrub continuously covered in clusters of globular flowers from early summer until frost. This rose is considered one of the best red roses ever bred. 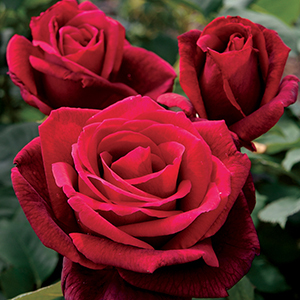 It has large, deep red blooms with incredible velvety petals. The flowers emit a strong, damask fragrance that make an ideal cut flower. This plant forms an upright shrub that holds its shape well. 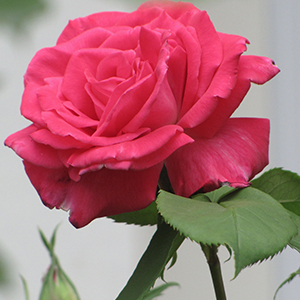 Large, deep pink blooms are borne mostly solitarily throughout the season with a heavy “old rose” fragrance. Peter Mayle™ is very vigorous and disease resistant with beautiful dark green foliage that wonderfully offsets the deep pink blooms. Peachy pink buds open up into large, full creamy blooms that cover this rounded shrub all season long. Blooms are typically borne in clusters, and the bushy rounded habit makes Lichfield Angel™ a stand-out choice for beds and borders. 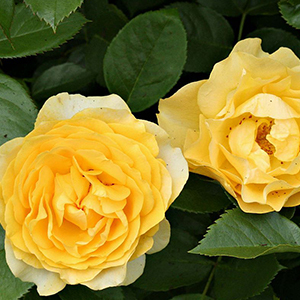 This continuously blooming yellow rose is disease resistant and very versatile. It can be pruned as a shrub or trained as a short climber. 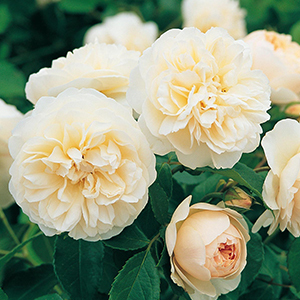 Winner of the Henry Edland Medal in 2000 for the most fragrant variety in the Royal National Rose Society Trials. 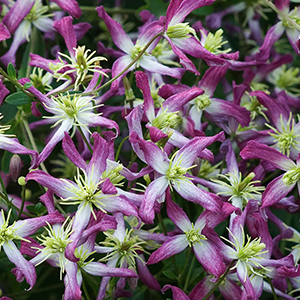 Clematis are wonderful vines perfect for growing in containers, through trees, on a rose, or up a trellis. 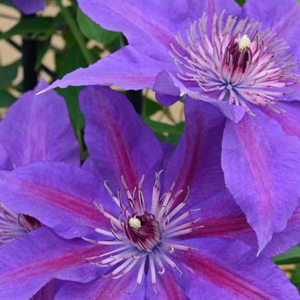 This year we will have the ever-popular assorted varieties of clematis 3.5-inch pots that are easy to carry, so you’ll want to stock up on a few! The colors range from white to various shades of purple to deep burgundy. There is something for everyone and our selections will add interest to any and all gardens. 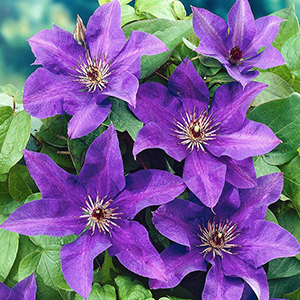 This cute little clematis has stunning deep purple flowers with red centers and pure white tips on each petal. While it will grow in shade, the flowers produce their best coloring in full sun. A very good repeat-flowering double clematis, which is also mostly free flowering. Each individual flower will last up to 4 weeks. 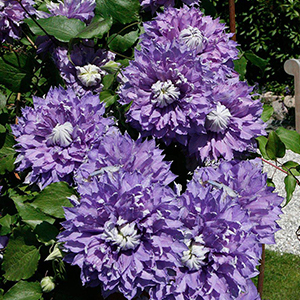 This clematis always produces double flowers even if all its top growth is killed to soil level after a hard winter. Ideal for a small garden or for growing in a container on the deck garden, patio or outdoor eating area. An English hybrid introduced around 1880. A winner of the coveted Royal Horticulture Society’s Award of Garden Merit. 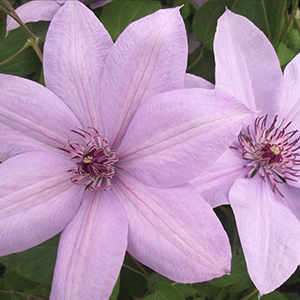 This clematis produces an abundance of starry shaped, lilac-tinted, heavily scented flowers from mid-summer through fall. 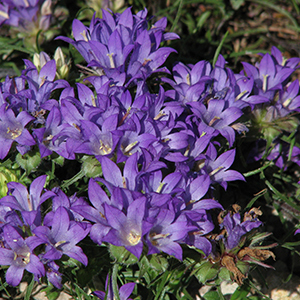 Flowers are violet blue in color, and they arrive steadily for most of the summer. Consistently delivers a great show, and is one of the best repeat bloomers. Superb with climbing roses. The Delaware Valley Chapter of the North American Rock Garden Society will offer a wide range of rock garden plants. 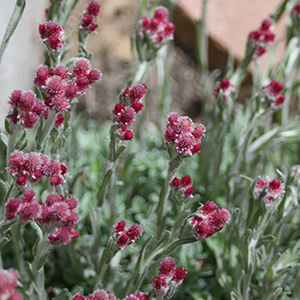 Rock garden plants provide a lot of bloom on a small plant. In addition, many of them have distinctive foliage that is ornamental for the full gardening season. 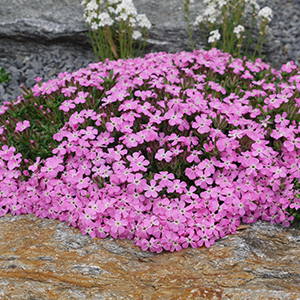 Rock garden plants evoke the beauty of high mountain places, yet they can be quite practical for growing in small spaces or difficult areas. 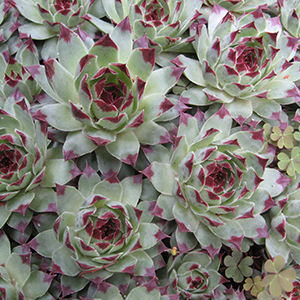 We will be selling some particularly good varieties of some easy-to-grow plants, such as hen-and-chicks (Sempervivum), small sedums, and moss phlox (Phlox subulata). We will also offer some unusual plants: uncommon alpine plants, hard-to-find woodland plants, and a few pitcher plants and other bog plants. For a list, visit The Rock Garden Society site. The Rock Garden Society is open to anyone interested in rock gardening—or just in learning about a wider range of garden plants and techniques. The Delaware Valley Chapter meets monthly in Plymouth Meeting. We also hold garden tours, workshops, and members-only plant sales. For more information or to join, visit the chapter web site. The Greater Philadelphia Chapter of the American Rhododendron Society will again hold its annual Plant Sale at the Morris Arboretum this year. 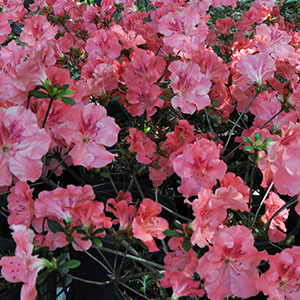 Outstanding varieties of large-leaf (elepidotes) and small-leaf (lepidotes) rhododendrons will be offered, as will azaleas, both evergreen and deciduous, and Kalmia (mountain laurels). The plants were selected for their colorful floral display and interesting plant forms and foliage. Native rhododendrons will be available for sale. All are hardy in the Delaware Valley. Join the Greater Philadelphia Chapter of the American Rhododendron Society during the Plant Sale and you will receive a choice rhododendron. Membership in the society features an outstanding quarterly journal, access to annual and regional conferences, and an exciting seed exchange. The chapter meets at Morris Arboretum with informative speakers, exhibits plants in formal displays at the Philadelphia Flower Show, and maintains a Plants for Members program to make rarely offered rhododendrons available to members. Visit the chapter’s website at gpchapterars.org.